My lil’ Ms. JG & I try to do Fridates as often as we can because we’re all pooped out on weekdays when there’s school and work. Most of the time, we find ourselves on automatic mode from Monday to Friday. Sleep early- wake up early- prepare for school- prepare for work- workout- errands- pick up kids from school- eat- chores- work- eat- sleep early- repeat. It’s a cycle we’ve gotten used to. So to break our routine, I promise my lil’ Ms. JG that we’ll do Fridates as our way to reward ourselves and do some girl bonding. When lil’ Mr. JG is a little bit older (a year or two from now) I’ll dedicate a day for him too so we can do mom-son dates as well. Anyway, here’s a matchy-matchy outfit we wore during one of our Fridates. I was once not a fan of mom-daughter matchy-matchy. Why? Because I don’t want my daughter to be my shadow. Feeling ko kasi when we wear exactly the same thing, she needs to live up or level up to me, e that’s not what I want. I want her to let her personality shine. So to compromise, I make sure every time we do matchy-matchy, we’re not exactly the same. Just similar, not identical. In this case, we agreed to wear the same shirt but tweak the overall look. Not exactly the same jeans or shoes as to not make it too matchy-matchy. Casual Friday is our fave. Mom uniform= shirt + jeans + flats. I always go for comfort especially when I’m with my kids. How else can I take care of them if I feel uncomfortable with what I’m wearing? Although lil’ Ms. JG would insist I wear heels especially when we go on our dates, I skipped it this time because our date of choice involved a lot of walking – in the mall that is. Heehee. I honestly am fond of this lil’ lady and no, not because she’s my daughter (although it’s partly the reason hihi) but because she picks her own clothes and knows what she wants – unlike her mom who’s very indecisive up to this day. Heehee. No art direction for this one. I just asked her to stand and pose. 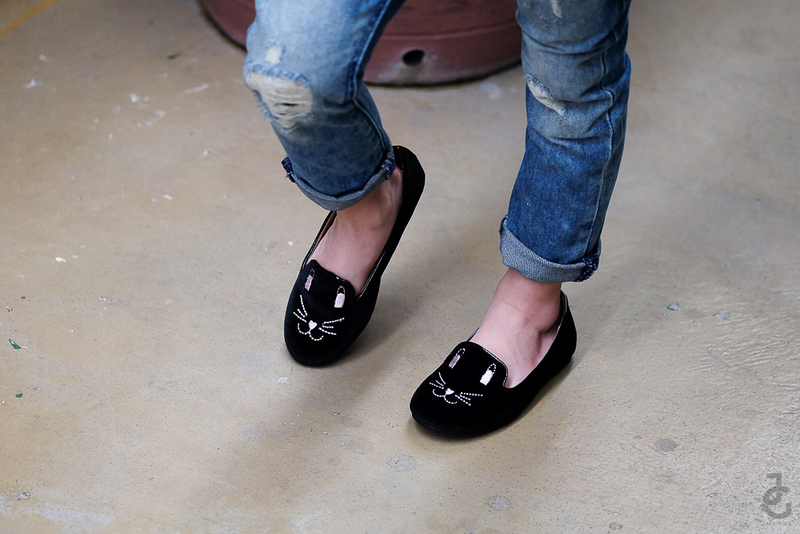 Too kyooooot this kitty cat slip ons. Visit the newly renovated MANGO Eastwood store, they now carry MANGO Kids. Yay! Lovely girls! Now I want a girl too, lol!!! Lol! What if another boy will come out? Hahaha.. You’re welcome, pretty Jackie! How old is your daughter? I love her overall look.. so comfy, relax and fashionista lang talaga ang peg.. I can relate because I have a 4-year old girl, hehehehe… nice one!